Unique protein- (nitrogen) and energy source for the ruminants. Thanks to the special retardation manufacturing technology, the urea dissolves and hydrolyzes slowly and consistently in the rumen. As a result of this, the urea product can be used as protein-source with higher efficiency and without the danger of poisoning. The safety of feeding with Mela-GO-50 is also improved by the easily utilizable carbohydrates (molasses, glucose) contained in the product. It is well suited to substitute a portion of the protein sources (e.g. : extracted sunflower meal, rapeseed meal) that are easily degradable in the rumen in a cost-effective way. By using this product the protein balance (MFN-MFE) of the ruminants can be influenced favourably in the rumen. The protected fat (hydrogenated fat) used as a retardant material is digested in the small intestine without negatively affecting the rumen activity and the crude fibre digestion. The energy-intake in the form of hydrogenated fat influenced the production of the animals favourably, furthermore improves the harmful effects (e.g. : metabolic diseases, fertilization problems etc.) of the negative energy balance (NEB) appearing in the postpartum period. It is advised to give the suggested dosage in two portions daily. The expected dosage can be applied after a 10-14-day training. Overdosage should be avoided. Before total dosage feeding, it has to be checked whether the feed portion contains other NPN-materials. The product has to be given only to animals with full-grown rumen functioning and with healthy liver functioning. It can be used for feeding ruminants only. 25 kg, in paper bags lined with polyethylene. Place of the experiments: University of West Hungary (UWH), Faculty of Agricultural and Food Sciences, Animal Research Centre. The ruminal degradation of the crude protein of the urea treatments applied in the experiments was examined with 4 Holstein-Friesian steers, equipped with rumen cannulas, with in situ method (Oldham, 1987). The incubation period was 2 hours. The bags were washed out 5 times following the incubation, then on the temperature of 60°C they were dried until reaching the air-dry condition. The experiment was repeated 3 times. The steers were trained for natural and retard urea with a 10-day pre-feeding. The animals did not eat the urea, but it was directly passed through a cannula, to be sure that the steers pick up the required amount of feed. After the 10-daypre-feeding, rumen fluid sample was taken through the cannula 4 times a week, before the morning feeding (at 7⁰⁰), and after that 4 times (7³⁰; 8⁰⁰; 9⁰⁰; 10⁰⁰). The rumen fluid sample was taken to the laboratory in a thermos, and its pH-value and NH3-content were observed there. Shown by the data, that natural urea has degraded in 100% already 2 hours after being in the rumen. 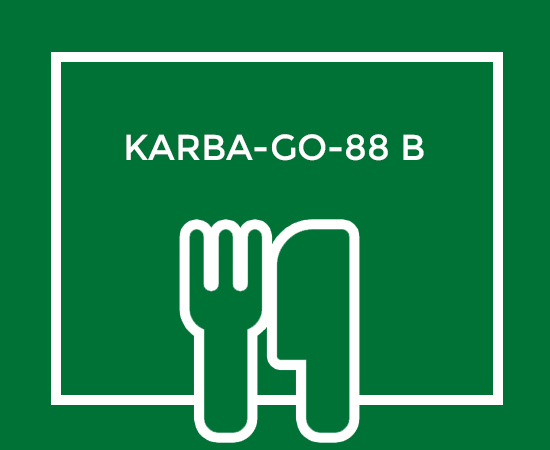 In contrast only 32.9% of the Karba-GO-75 products degraded, which proved to be significant at the P<0,001 level, during the statistical analysis. In the first 3 hours following the feeding, the pH-value and the ammonia-content of the rumen fluid samples show that the retard product (KARBA-GO-75) has significantly better effect than the natural urea. The “ammonium-peak” occurring after applying the natural urea, in case of the KARBA-GO-75 was significantly smaller. The produced product is suitable to use it in the feeding of ruminants – primarily steers and sheep, furthermore feeding of dairy cows. Examination of the degrability of the two products in the rumen using 8 and 16 hour incubation time. The experiment justifies the retard (degradate slowly) or the bypass (rumen-protected) type of the product. In the experiments we found that the products during the average time being in the rumen (approx. : 12 hours) were degraded nearly in 100%. It justifies that the developed rumen protection is retard, and not bypass type.